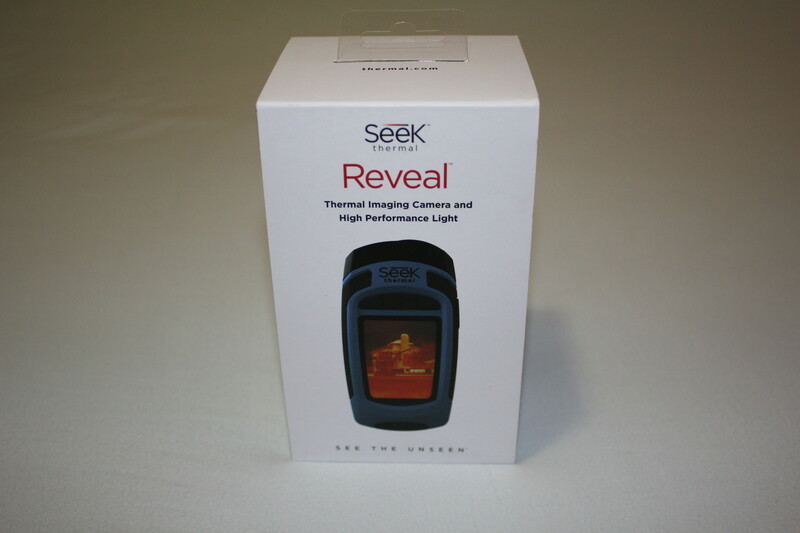 The Seek Thermal Reveal* is a compact thermal imaging camera for beginners, revealing what is invisible to the human eye. It is also offered in an Extended Range version for a price premium. We have subjected the device to a detailed test and report on the scope of delivery, quality and much more in the following. 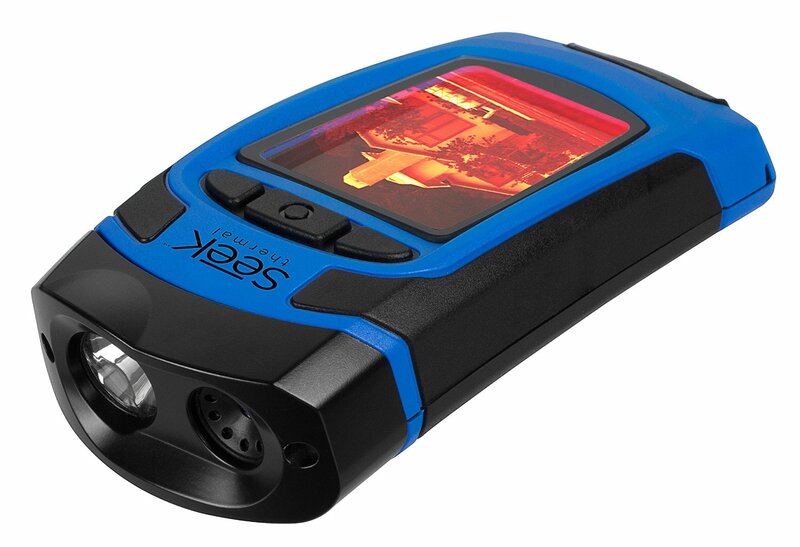 Learn more about possible applications, as well as the strengths and weaknesses of this stand-alone thermal imager. 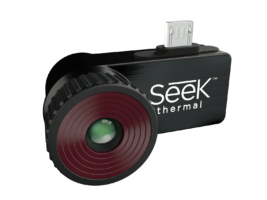 After the successful models “Compact Standard” and “Compact XR”, Seek Thermal is launching the thermal imaging camera “Reveal” for the thermographic market. It has been developed in the USA and has been available in since 2015. 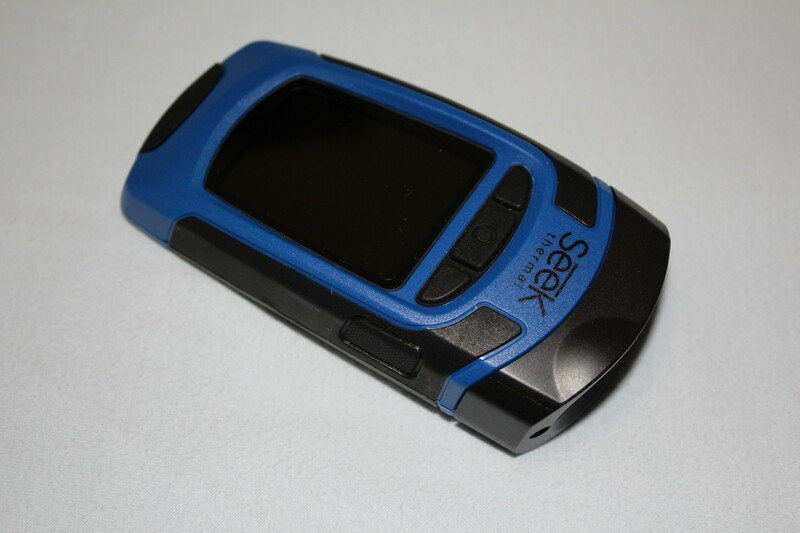 While the predecessor model was marketed as a low-cost smartphone attachment and could win many prospective customers, the Reveal is a completely independent device. It is therefore no longer necessary to pay attention to compatibility with a suitable smartphone. 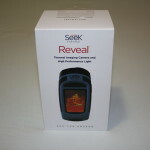 The “Reveal” has its own display and a generous battery integrated. The device is very robust and the housing is made of a hard plastic. Sensitive parts like the display, the sensor and the lamp are slightly lowered into the housing, so that they are protected in case of falls, storage in a toolbox, etc. The thermal imaging camera lies well in the hand and is used similar to a TV remote control. For transport, it still fist in trousers bag, but can also be hanged on the wrist. For this purpose, the supplied wrist loop can be threaded in an eyelet on the housing. After switching on the device it boots up very fast and is ready for operation in approx. 3 seconds. For calibration, the “Reveal” intermittently performs an interruption every few seconds, where the display of the IR image briefly stops. The sound is a quiet click, which hardly interferes. A digital camera for the superimposition of IR image and visual image is unfortunately not available. But you have to keep the price category in mind. But there is a real flashlight, which is operated by the button on the right. It is adjustable in two different brightness levels. The 300 lumens is convenient in dark heater rooms, under roofs or spaces like that. The accuracy of the temperature detection could be better. The values recorded should not given too much importance – not least because of the non-adjustable emission coefficient. However, the images themselves are well resolved and the thermal sensitivity is sufficient. They are also not blurry or distorted in any way – ideal for beginners. 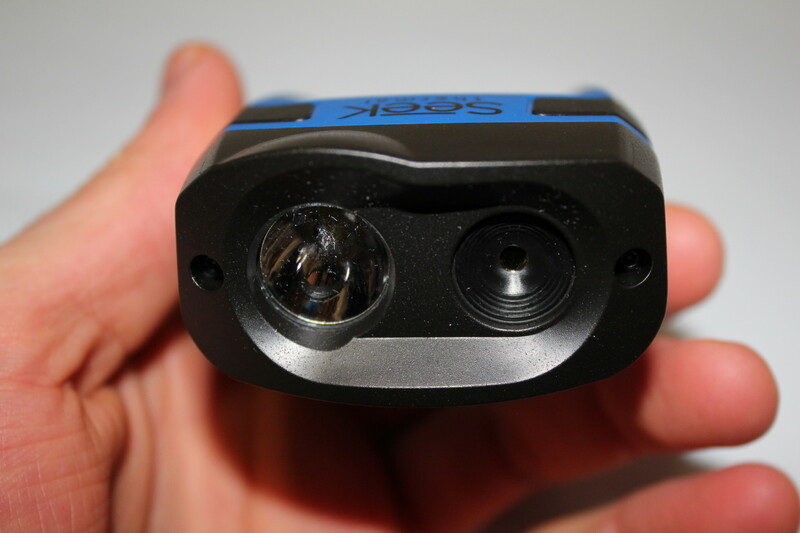 The manufacturer Seek states a distance of 152.4 meters (500 feet) for the “range” of the thermal imaging camera. With the XR version it is even 275 meters (900 feet) detection range. It is a pity that no videos can be recorded. Perhaps the computing performance of the device is too low or the memory space too small. Thanks to the dedicated battery, you do not have to worry about the battery life. 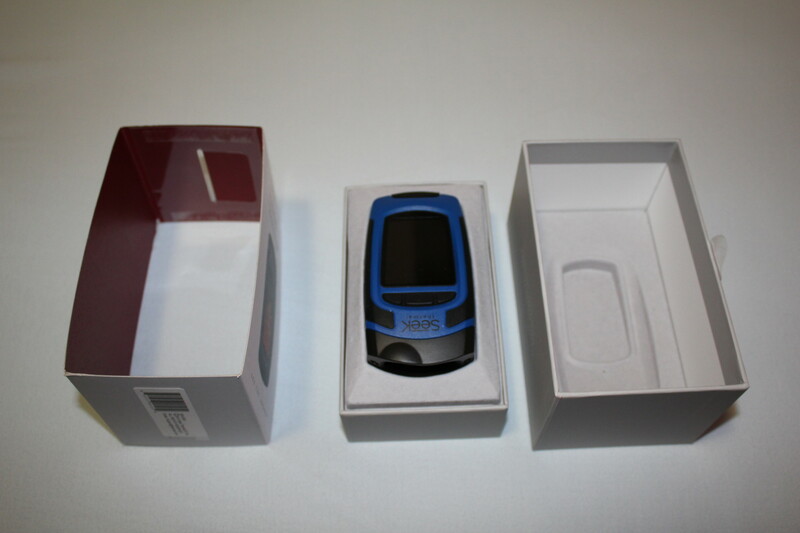 The device is energetically economical and the battery capacity is large enough. With a standard USB cable the thermal camera can be connected via a micro-USB socket and loaded directly. The charging duration is not too long. The general operation is performed via three buttons. Two of them – left and right – are for the navigation and the one in the middle to confirm and go to the menu. The switch is also used for switching on and off. Even the above-mentioned “flashlight” can also be adjusted with its two brightness levels in an extra menu point. In the menu you also get to the picture gallery, the device settings and the information. The picture gallery is very simple. You simply click back and forth through the recording and can delete individual pictures if necessary. The device settings allow a minute-accurate specification of the time and date. The time format can be selected between 12 hours and 24 hours format. The date format can be set between “American” (Month Day Year) and “European” (Day Month Year). As an energy-saving option, the device offers an automatic switch-off, which can be configured in minutes. An arbitrary setting of the display brightness is also possible. The displayed temperature in the measuring point can be in units Fahrenheit or Celsius. Finally, the device can also be reset to the factory settings via an option. Watch our video that shows all adjustable functions and the different color palettes of the device. Pressing “Capture” triggers the recording process, which saves the currently displayed image on the integrated SD card. This is nicely animated with a bar on the display, but unfortunately the saving takes about 4 seconds, which is a bit annoying. 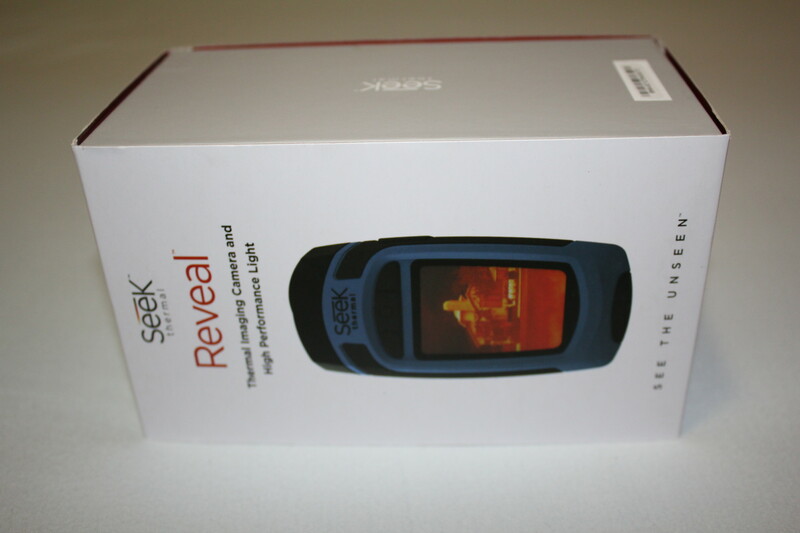 The images are stored on the Seek Thermal Reveal on a 512 MB Micro SD card. The slot for the card is located above the USB port and is not actually accessible to the user. With a flat screwdriver and tweezers, however, the SD card can be removed. With a larger SD card the storage capacity can be upgraded possibly. Normally, the Reveal is simply plugged with the USB cable to a PC and transfers the data from the SD card without major problems. The format of the pictures is PNG. In the test, there was an error with the picture viewer “XnView”. With the standard image viewer from Windows and an image processing software, however, the recordings could be easily opened. According to the manufacturer, this problem can occur in rare cases (Link). The file size per image is 223 KB at 231 x 306 pixels. The Seek Thermal Reveal offers quite a few color palettes for the representatio nof the IR data: “White”, “Black”, “Iron”, “Cool”, “Tyrian”, “Glory” und “Glow”. Different palettes have different applications. Some are better suited, for example, for the investigation of technical devices, others perhaps for object monitoring. If you want to find an escaped animal, you should set the palettes “Black”, “White”, “Glow” or “Glory”. The palettes “Tyrian”, “Iron” and “Cool” are good for analyzing electronics, mechanics and heaters. A fix focus lens was installed, i.e manual adjustment for focus, etc. is not required. The FOV (viewing angle) with 36 ° is relatively balanced and facilitates indoor shots as well as distance shots. The main difference in the XR version is a FOV of only 20 °. 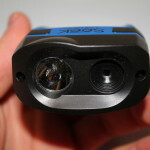 This makes the XR more suitable for outdoor use and has a higher detection range than the standard version. For the resolution of the display, the manufacturer states 240 x 320 pixel, which is technically rather “retro”. The sensor resolution is 206 x 156 pixels – like the “Compact”. Probably the same module was installed. However, the resulting image format is somewhat different to the previous model. The sensor scores points for it can detect temperatures in a range of -40 ° C to 330 ° C (-40° F to 626° F). This opens up many possibilities for application. In houses, the Reveal cat detect heat losses as well as wet walls. Also in the sanitary domain it is certainly a useful high-tech tool to detect blockages and leakages. For electricians, it can be convenient in the routine checking of circuits and fuses to spot overloads without actually touching anything. In the test, the Reveal made a good impression, especially when taking close-ups of electronics. The use for the examination of solar modules in photovoltaics is also conceivable. The manufacturer also promotes the detection of wild animals with the reveal in the dark and also for a use in object protection to reveal intruders. 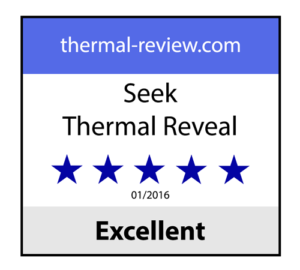 With the thermal imaging camera “Reveal” the manufacturer Seek Thermal penetrates into the market for beginners. The device is a full-fledged thermal imaging camera which already delivers good images and is robust enough for everyday use at work. No special features like image-combining and video-recording were available, but the price / performance ratio is nevertheless very good and only a few other products can keep up. The operation is very simple. Beginners can not make much mistakes, but still quickly capture valuable pictures. The standard model is recommended for indoor use and the XR version for outdoor use (eg hunting). For those interested and beginners of thermography it is a great device, for which a purchase recommendation can be pronounced.